Got 3 minutes, Mom? You’ll find the spiritual pick-me-up you need with these just-right-sized readings and prayers created just for you! This delightful devotional packs a powerful dose of comfort, encouragement, and inspiration into dozens of 3-minute readings designed to meet you right where you are in life. Minute 1: meditate on a scripture selection; Minute 2: read through a devotional created just for you; Minute 3: read a prayer designed to help jump-start your conversation with God. In 3 short minutes, you’ll be on your way to complete spiritual refreshment! 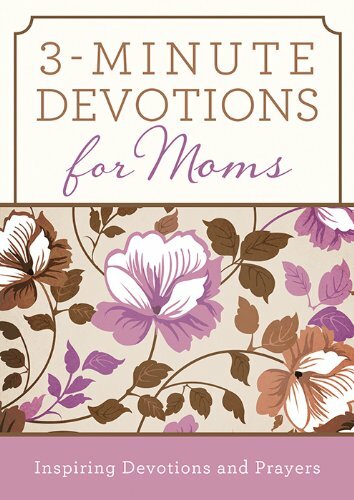 Written especially for mothers, this devotional packs a powerful dose of comfort, encouragement, and inspiration into just-right-sized readings for moms of all ages and stages. Each day’s reading meets moms right where they are—and is complemented by a relevant scripture and prayer.